City of Delaware Economic Development Department - Your New Startup - Moving From Ideas to Action! Your New Startup - Moving From Ideas to Action! Your New Startup – Moving from Ideas to Action! The stages of launching a startup and what to focus on each stage. 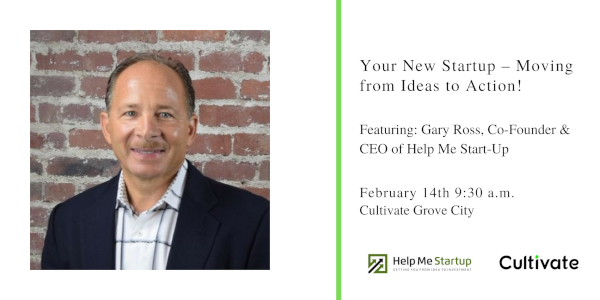 Gary Ross is a dual threat startup entrepreneur – having himself successfully started up companies and invested in companies. He has had success leading the growth of software, technology and service businesses as a division President in a global Fortune 500 company, leading two smaller family-owned businesses (one to private equity exit), and has successfully launched three startup companies, including gaining outside investment. Gary graduated with honors from Kent State University with a degree in Mathematics and achieved his MBA from The Ohio State University with a focus on International Business. In addition to completing a 2-year relocation assignment in Europe, Gary has successfully planned and implemented 15 acquisitions, integrations, and exits – in the U.S. and abroad – and has received an international business alumni recognition award from The Ohio State University. In 2017, Gary released his first book, The Growth Cube, which outlines his formula for business success: A 6-dimensional strategy and execution process that will unlock the growth potential of your business – and you as a leader!